Wow. Talk about a World Series for the ages, the 2011 World Series proved to be one of the most exciting and entertaining World Series ever. I’m still recovering, which is why my Game Seven blog is a bit late in getting out. Nothing like coming home and catching up on being a father with Halloween around the corner. First things first. Game Seven’s photo rotation had me in the third base photo pit with Brad Mangin upstairs in the elevated first spot and MLB Director of Photography Rich Pilling in the inside first photo well, next to Cardinal team photographer Scott Rovak. What this meant was that I was the “clubhouse” guy for tonight. Champagne. Sticky, nasty, eye stinging champagne. Oh well. The luck of the draw hadn’t gone my way since the Cardinals last won in 2006, so I was due. Pregame was spent enclosing my Nikon D3s, 24-70 (utilizing a screw on UV filter for added protection) and SB-800 in Aqua-tech housings. I will say this much. Properly attached, the Aqua-tech housing for camera, lens and flash performs very well considering the circumstances. Rain usually doesn’t stream at you from all angles under pressure like freshly opened champagne does. Since I own my gear, I spend a little extra time to get things on right in the hopes of minimizing potential problems later on. 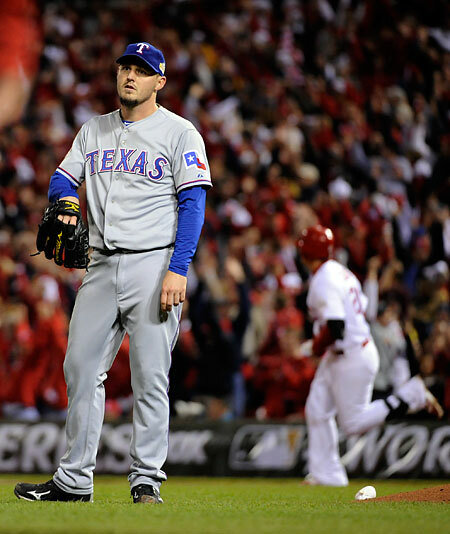 As I was getting ready for Game Seven I wondered just how the Texas Rangers would respond to Game Six’s double letdown. I still can’t quite imagine how I would respond if my team had been within one strike of winning the World Series with a two run lead and two outs twice! 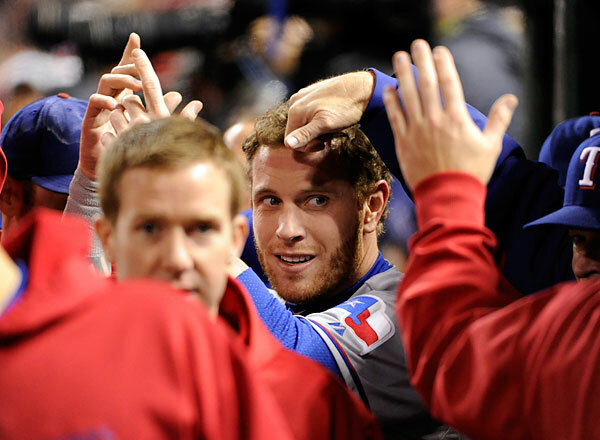 The Rangers actually started off strong, scoring two runs in the first inning off of Cardinals ace Chris Carpenter. 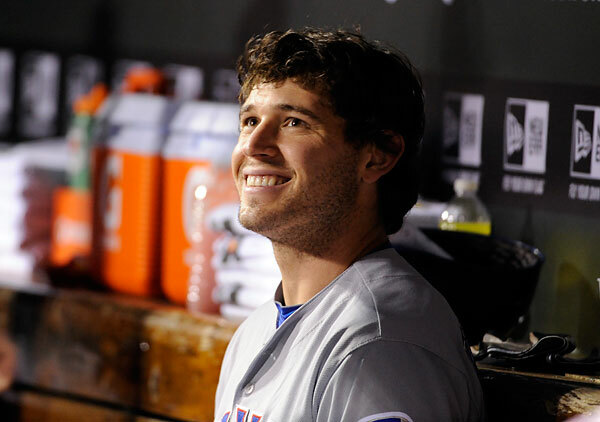 Now the question was could the Rangers pitching hold off the Cardinals offensive machine. With two outs and nobody on in the bottom of the first, the Cardinals got started and plated two runs on future World Series MVP David Freese’s double. Right back at ya, Rangers. The speed in which the Cardinals tied the score seemed to take the life right out of the Rangers and when Allen Craig hit a solo home run in the bottom of the third, the Cardinals seemed comfortably in command, even though they only had a one-run lead. Two more runs in the fifth gave the Cardinals some breathing room, and with Chris Carpenter settled in, things weren’t looking too good for Rangers Nation. As the game progressed, I began to think about who to focus on during the initial post-game celebration/scrum following the final out. David Freese seemed like a no-brainer, but since I was shooting from third base he would be in front of me, so I left that potential scenario to Brad and Rich. I decided I was too far away from Albert Pujols so I went with Jason Motte. What was not predicted was that Cardinals manager Tony LaRussa pulled David Freese for a defensive replacement forth ninth inning. You have got to be kidding me! The soon to be named MVP pulled from the game? No jube pictures with the Series MVP? A photo let down for sure, especially for Brad and Rich. Everyone went to Motte. There is a 10 second “hold” on the initial celebration so that no television cameras interfere with the photo. 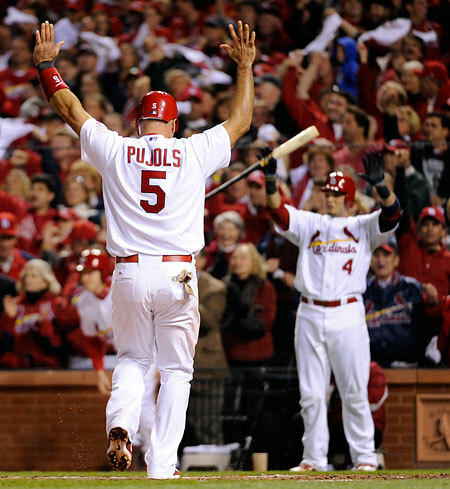 As the last out was made, I focused on Motte and waited for what seemed forever to Yadier Molina to jump in his arms. Forever was right, because just as Molina reached the apex of his leap, the third base umpire walked in front of my camera! I was able to make one decent frame, but the best frame was lost in the pant legs of the umpire. Seconds later, they “released the hounds” and network and MLB production television crews raced to the pile up on the mound. My outside work was done. Time to head into the Cardinals clubhouse. I gave our photo runner my long lens and jacket and donned my REI rain suit and made my way to the Cardinals dugout, where I was let in to the clubhouse via the tunnel. I was the only photographer allowed in this way, everyone else was in line outside the main entrance to the Cardinals clubhouse. No worries, though. 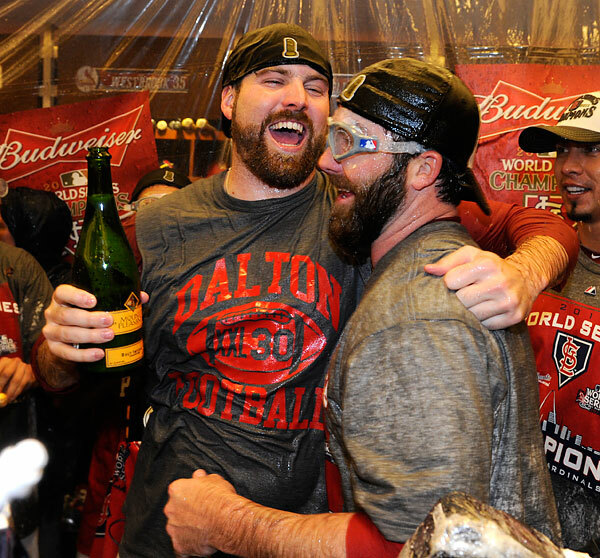 Since the trophy presentation was made on the field, there was nobody in the clubhouse for what seemed like forever. 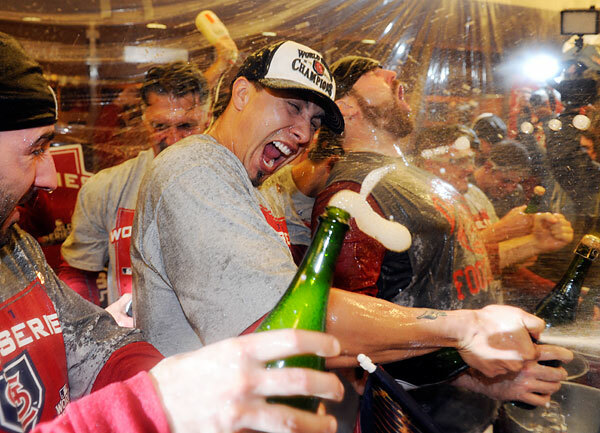 And even when the players began to filter in, no one opened any champagne until MVP David Freese came in. And with Freese being mobbed with interview requests, the wait was on. Finally, Freese appeared and the corks popped. Unfortunately, picture wise, there was one or two larger groups of players just drenching the scene. What makes better pictures are small groups of two or three players celebrating, not a waterfall of champagne from under which focus is impossible. Word of advise for those who have never ventured into a champagne storm. Bring a couple of towels. It is critical to occasionally wipe the champagne off the front of the lens so that you at least have a chance to focus properly. The scene petered out quickly, and I headed back to the photo work room to rinse off my cameras with water (very little champagne made it past my Aqua-tech housings) and toss my rain suit into a plastic garbage bag. It was all over. 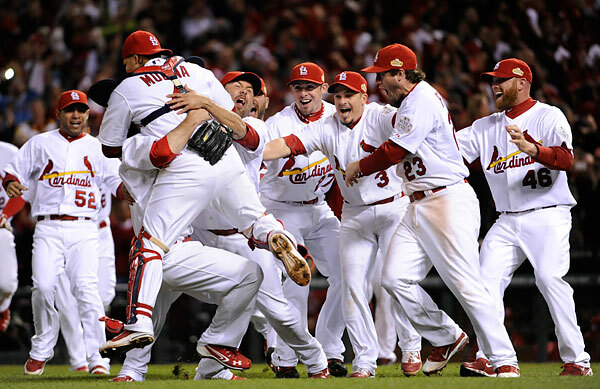 Goodbye’s were exchanged as the photographers who covered this historic World Series packed their gear and headed home. A long season has once again come to a close, but heading home is always bitter sweet for baseball junkies like myself. The memories of this World Series will help get me through this winter. 1991, 1993, 2005 and now 2011. But in the back of my mind I can’t help but think… Can spring training only be 15 weeks away? This entry was posted on Wednesday, November 2nd, 2011 at 11:00 AM	and is filed under Assignments. You can follow any responses to this entry through the RSS 2.0 feed.